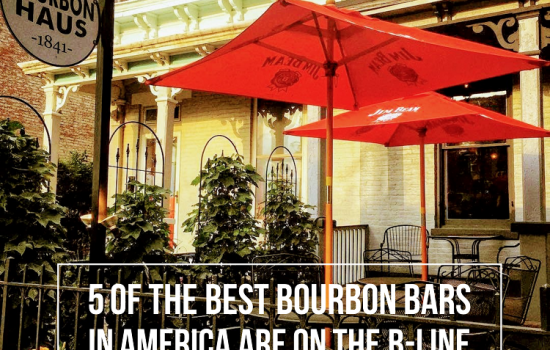 The B-Line adds a new twist to Kentucky bourbon country as it showcases five cool bourbon-centric bars plus three distilleries that are also on the Kentucky Bourbon Trail Craft Tour® and four snazzy restaurants in Downtown Covington and the surrounding hills of Northern Kentucky. 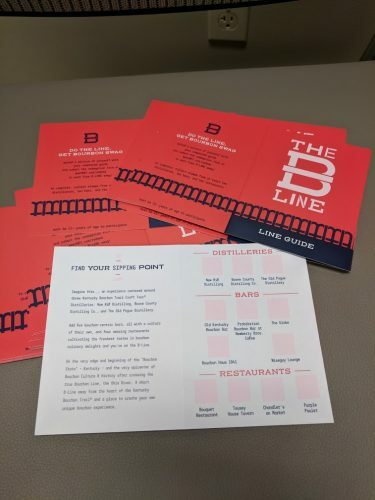 Grab a free Line Guide at any participating stop on The B-Line and get ready to “find your sipping point” in Northern Kentucky, which was designated an “Official Gateway to the Kentucky Bourbon Trail” by the Kentucky Distillers’ Association in 2017. 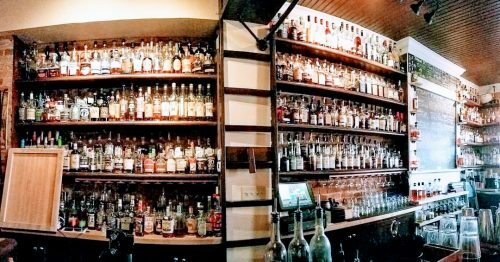 Bourbon Haus 1841 boasts the largest selection of bourbons in Covington’s Mainstrasse Village with an impressive stash of 150 bottles and counting. The bar specializes in bourbon flights that feature three selections and bear creative names like “stairway to heaven,” “sweet emotion,” “bad to the bone,” “just what I needed,” and others so you can order based on your mood or whichever flavor profile sounds most beguiling. 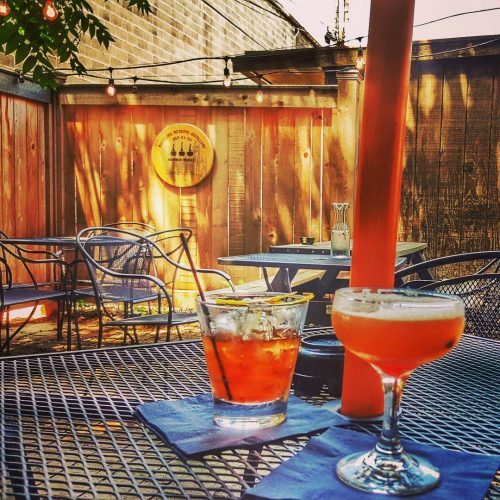 Sit at the 150-year-old antique wooden bar relocated from Bardstown in the dining room or under an umbrella on the front deck or brick alley patio. 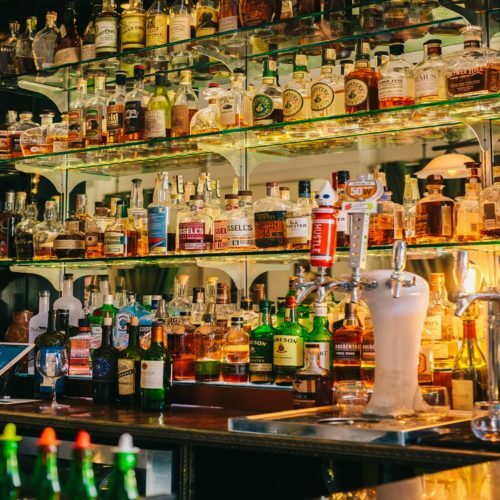 Bourbon options range from popular favorites to hard-to-find treasures, though you might also opt to sip one of the bourbon-centric cocktails, local craft beers or fine wines. With its old-timey vibe, plus couches, and reclaimed barrels, the bar has a refined retro ambiance. 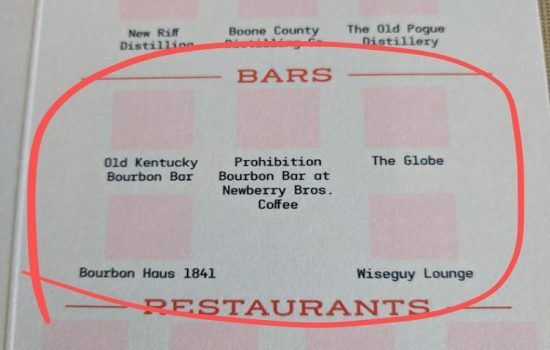 The Globe pours more than 100 different bourbons and showcases Kentucky and regional spirits and craft beers across its menu. Housed in a former gentlemen’s club, this Downtown Covington bar has an inviting, neighborly vibe. Sit on a stool at the bar, in a cozy couch, or under an umbrella on the patio. Sip your pick among the handcrafted cocktails with options from tried-and-true classics to new creations. All cocktails, such as “Pass The Buck” with bourbon, honey, lemon juice, peach bitters and a pinch of salt, are thoughtfully designed and expertly prepared. Others, like “5th St. Manhattan” with double-oaked bourbon, vermouth and amaro plus a splash of black walnut bitters, give traditions a flavorful spin. Savor one while chatting with your travel companions or friendly locals, nibbling on snacks like crispy curried chickpeas or warm citrus olives, and even playing one of the board games that are on hand to borrow. 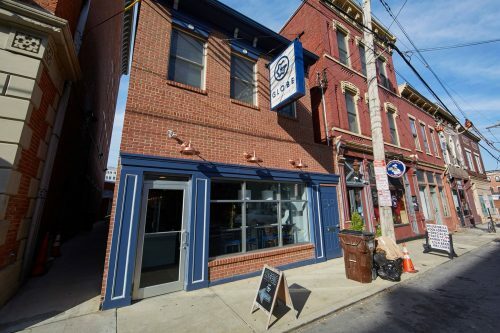 Old Kentucky Bourbon Bar, located in the heart of Mainstrasse Village, doesn’t bother with a menu since you can see what they have to pour sitting on shelves right behind the bar—and in this cozy space most seats are at the bar. (A few tables and chairs are on an outdoor patio, perfect if you prefer to pair a drink with a cigar.) Over 100 bourbons are in stock alongside ryes and other spirits. 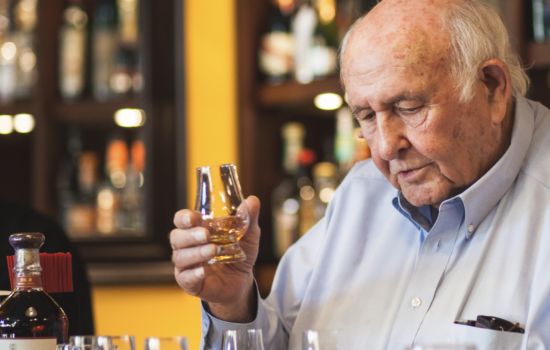 The focus here is on education, so staff members receive extensive training in order to answer whatever bourbon and whiskey questions you may toss out regarding brand history, flavor profiles and production processes. Give your palate a bourbon lesson by ordering a flight so you can sample sips side-by-side. Pick your own line-up of spirits to compare or get recommendations from a bartender. This is a great place to taste a variety of different bourbons and discover something new, whether you prefer a straight-up introduction or a cocktail mixer. The vibrant vibe and cozy seating inside OKBB encourages mingling. Prohibition Bourbon Bar assumes a speakeasy stance since only its neighboring Newberry Bros. Coffee is mentioned on the sign out front, but it’s easy to get inside since no secret code or knock is required. 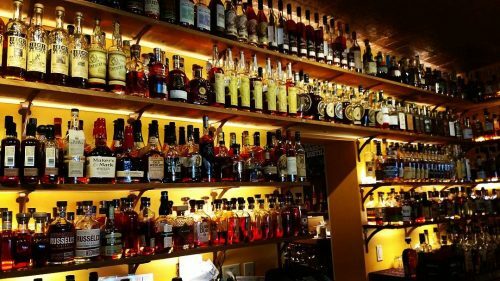 Odds are high that you’ll find what you crave here in Newport’s Historic East Row District: This bar is home to the world’s largest collection of bourbons and rye whiskies—over 1,500 and counting! There’s also a great selection of Scotch, Irish and Japanese whiskies plus over 50 wines and 50 craft beers. Come try different bourbons side by side, finally sip that elusive bourbon you’ve long wanted to try, or savor a classic cocktail. The place has a friendly vibe based on discovery, sharing and fun. 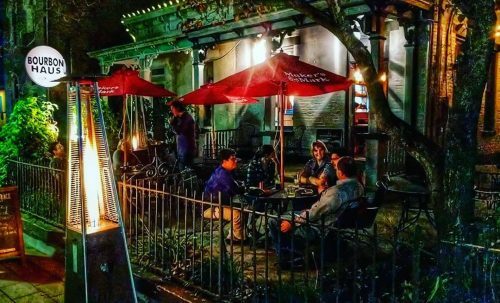 Seating inside is cozy with both bar stools and red banquets available, but if you want as much elbow room as possible grab a seat on the dog-friendly patio. To satisfy additional cravings, the adjacent coffee roaster serves espresso drinks plus savory small plates and indulgent desserts. Prohibition also offers a retail component, so you may be able to buy a hard-to-find bottle while you’re here, too, for savoring once back at home. 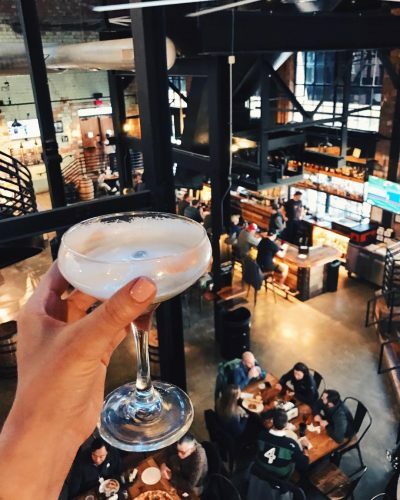 Wiseguy Lounge, located in Mainstrasse Village on the second level of Goodfellas Pizza, boasts more than 250 bourbons. Something intoxicating hits you long before you even order a drink: The aroma of New York-style pizza, which ramps up anticipation before you reach the top of the stairs where this speakeasy-inspired bar is “hidden.” (There’s another set of stairs around back, but even that route may not help you avoid pizza cravings.) You won’t need a code to enter this lounge inspired by 1920s-era hideaways, just come on in. As during Prohibition, cocktails use fresh-pressed juices and homemade syrups, are handcrafted by snappy-dressed bartenders, and served in a dimly-lit room with leather sofas. Watch bartenders rattle ice in glass beakers, add tinctures and bitters one drop at a time, and even set fire to orange peels while pondering menu options. Consider the award-winning Midnight Express that blends bourbon with stout beer, crushed coffee beans and vanilla or the award-winning Boss-Manhattan that is as take-charge as it sounds. Each bar on The B-Line is an inviting place to linger. You may only need two bar stamps in your passport, but truth is you really won’t want to miss any of them. Though there are thousands of whiskeys and cocktails worth sampling, consume responsibly. If you happen to over-indulge, note that many bars on The B-Line are within walking distance of the luxuriously cool Hotel Covington. Not ready for bed? 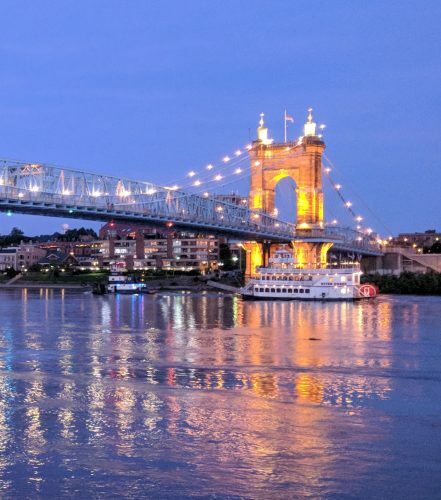 Walk around Downtown Covington and even cross any of the pedestrian bridges over the Ohio River—the actual B-Line that borders the “bourbon state” of Kentucky, where 95 percent of the world’s bourbon is produced—into Cincinnati, Ohio. Don’t miss the John A. Roebling Suspension Bridge, which was the longest suspension bridge in the world from 1867 until 1883 when Roebling’s most famous project, the Brooklyn Bridge, opened. You can also use promo code TheBLine on Lyft or 3SEO on Uber for safe ride discounts while doing The B-Line.